One of the most overlooked facets of trucking is the importance of choosing the right scale for your specific application. There are a wide variety of scales on the market. As with any product, finding the right solution for your needs can often be a journey fraught with trial and error as well as purchases and returns because it is so difficult to choose the right scale. Not anymore. Floor Scales Direct provides many different permanent and semi-permanent truck scales as well as several portable truck scales to meet your needs in a variety of applications with clear product explanations to help you make the best decision without wasting time or money. Here are a few key things that you should consider shopping for the perfect scale solution to meet your needs. In what environment will your scale be used? What is the maximum gross weight of the vehicle and payload to be weighed? Will there be moisture or dust present? Will you need to move the scale often? You should ask yourself these questions before you start shopping as they are the foundation for choosing your perfect scale. Let’s begin with the last question. Some scales are several thousand pounds and designed to be mostly stationary. Others are smaller than a briefcase and can be carried in a vehicle for mobile deployment and use. Floor Scales Direct offers heavy-duty, continued use scales in many sizes, each with its own unique benefits. We offer truck scales that are watertight and ideal for repeated, heavy use. We also offer compact, portable truck scales that can simplify on-the-go inspections. Make sure to choose a scale that can handle your vehicle’s weight and consider purchasing a scale that comes equipped with overload protection. One advancement in industrial scale design that has become commonplace over the years is the elimination of mechanical parts. This is one key benefit that you may wish to consider when choosing a long-lasting scale option. 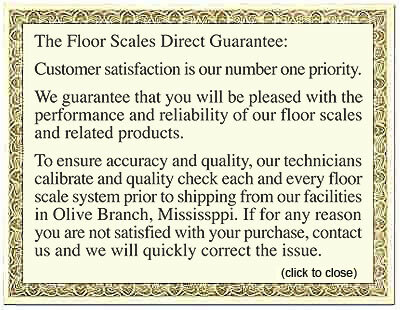 For more information on choosing the right scale and a personal usage evaluation, contact one of the pros at Floor Scales Direct.